One of the many characteristics that make the Candida Plan a unique approach to detoxifying the body is that each phase has a very specific goal and attribute. This phase of the Candida Plan has a specific aim, which is to “neutralize” the fungus (Candida) by converting it back to its yeast form at which point is no longer harmful. Trying to “kill” Candida is a common mistake that enables it to adapt and become even stronger. Dr. McCombs’s anti-Candida diet is a tried-and-tested eating plan that eliminates foods that promote the growth of fungus, bad bacteria and mucous. During this phase we provide the body with key elements to facilitate the disposal of toxic waste which decreases the stress load on tissues like the liver and gall bladder and avoids the normal die-off reactions that so many people suffer with other detoxification programs. This is the last phase of the Candida Plan and it marks the comeback of the good bacteria in the form of probiotics. Repopulating your intestinal tract with good bacteria is only possible after the fungus (Candida) is neutralized. Any sense of relief experienced due to the intake of probiotics alone is only temporary, as it happens with many other protocols. A good metaphor to understand this process is to think of your intestinal tract as an ecosystem. As long as there are toxic elements polluting your inner environment there’ll be very little chance of reforestation. 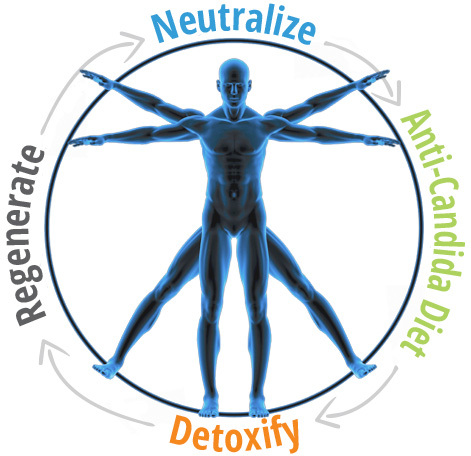 Dr. McCombs’ Candida Plan (formerly The Lifeforce Plan) is an effective, nontoxic, science-based approach to return candida back to its normal yeast form, detoxify the body, boost the appropriate immune responses, and restore normal tissue flora. It is a time-proven approach that since 1993 has improved the health and lives of thousands of people in over 70 countries worldwide. It re-awakens the body’s innate ability to regulate, balance, and protect itself and allows us to activate the endless life-force potential that resides in every cell of our bodies. Its seemingly miraculous results are achieved by helping to reverse the ravaging effects that antibiotics produce in the body. Though antibiotics may have a time and place, it is their overuse, misuse, abuse and even accepted use that produces devastating imbalances within the body. Dr. McCombs’ Candida Plan assists the body in restoring the body’s regenerative, life-enhancing cycles over the degenerative, “aging” cycles. It succeeds where other candida treatments and diets have continuously failed due to key fundamental insights. It also provides a way to balance the effects of antibiotics when their judicious use is necessary. It is not intended to be another “diet” as such, but rather a way to achieve greater levels of health that will enable you to make better dietary choices that work for you. It is a “bridge” back to an optimal state of health for our bodies.